Life for dozens of families in Savann Kabrit, Haiti, is looking brighter after they received homes and an opportunity to escape the cycle of poverty, thanks to the generosity of Ben and Louise Scott, Boca Grande Hope For Haitians and Food For The Poor. Last year, when Scott met Marie and her five children, their living condition was dire. Her husband was ill and had to lie on the damp mud floor because they had no bed. The fragile structure that was their home collapsed shortly after Scott met with them. The family had to live with others within the community until their home was built. The group funded 50 homes for the first phase in Savann Kabrit, 30 of which have been completed, and the rest of the homes will be built later. Eager to see the progress made possible by the support of last year’s fundraisers, Scott returned to Savann Kabrit with Food For The Poor Executive Director Angel Aloma this month. They were greeted with expressions of deep gratitude from Marie and others. Many within the community had helped by taking materials to construction sites. Scott’s friends and supporters from Piqua, Ohio, Frank and Julie Gilardi, also were on the mission trip and experienced the Caribbean nation for the first time. Located east of Port-au-Prince near the border of the Dominican Republic, wood and mud huts in Savann Kabrit that have no toilets or ability to lock their doors are being replaced with colorful concrete block homes. As Scott prepares to celebrate 10 years with Food For The Poor, his goal for 2019 is to build an additional 50 homes within the Savann Kabrit community. Scott and Boca Grande Hope For Haitians began building homes in Haiti with the international relief and development organization in 2009. Scott and the Gilardis also visited Alpha Village in Gressier, where Boca Grande Hope For Haitians has built 138 homes. The homes have been maintained and are surrounded with fruit trees, plants and other personal touches. The group received a warm reception from the residents who gathered inside the community center to welcome back a friend. Fundraising for an additional 50 homes in Savann Kabrit will continue with the Boca Grande Hope For Haitians annual cocktail and hors d’oeuvres reception at The Gasparilla Inn Beach Club in Boca Grande on Tuesday, Feb. 5, 2019. The party will feature a silent auction. Guests attending the event will hear from keynote speaker Delane Bailey-Herd, senior field manager of Food For The Poor, who will share how lives are being transformed in Haiti thanks to the passion and generosity of Boca Grande supporters. Committee members include Chairpersons Ben and Louise Scott, the Rev. Gary Beatty, the Rev. Jerome Carosella, the Rev. Michelle Robertshaw, the Rev. Matthew M. Williams, Henry and Ginny Bryant, George and Lois Castrucci, Patricia Chapman, John Denneen, Charlie and Florita Field, Lou and Corie Fusz, Jim and Linda Grant, Stephen and Susan Jansen, Tom and Nancy Lorden, and Sue Sligar. 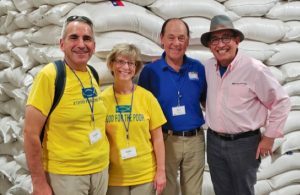 Food For The Poor, one of the largest international relief and development organizations in the nation, does much more than feed millions of the hungry poor, primarily in 17 countries of the Caribbean and Latin America. This interdenominational Christian ministry provides emergency relief assistance, clean water, medicine, educational materials, homes, support for orphans and the aged, skills training and micro-enterprise development assistance. For more information, please visit FoodForThePoor.org.